Beautiful townhome at the edge of Bozeman with walking trails along Bridger Creek right out the back door. New February 2019- Queen size bed in the second bedroom. BRIEF DESCRIPTION: This small comfortably appointed townhome is perfect for smaller groups. It’s close enough to our historic downtown to bike or drive easily, but it sits right at the edge of town, with walking trails and great mountain views right there. Guests are surprised to find the fishing on Bridger Creek can be very good just a short walk from the home. 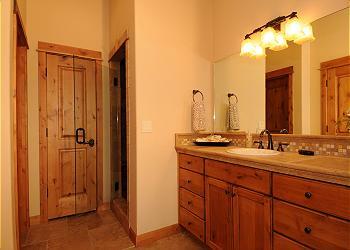 You’ll be pleasantly surprised by the high quality and handsome “rustic” details in the home’s construction. This is not your average townhouse. BEDROOMS AND BATHS: Bridger Bungalow has two bedrooms and two baths. 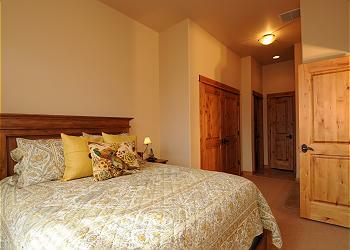 The master bedroom has a queen size bed and a full private bathroom. It has a large closet and a walk-in shower. This bedroom also has a 40” Samsung flat screen TV. The second bedroom has a queen bed. The second bathroom is located off the hallway and has a tub/shower combination. For additional sleeping space there is also a pull-out sofa in the living room. KITCHEN: The beautiful kitchen is stocked with everything you will need to prepare your meals. It has gorgeous granite counter tops and professional Frigidaire refrigerator and stove. The open layout will allow the cook in the group to enjoy making the meals while everyone relaxes in front of the fireplace. There is also a gas grill on the porch. 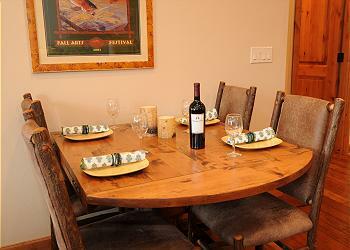 DINING AREA: There’s a dining table that will seat four comfortably. Just a few feet away there is seating for two more at the kitchen bar. LIVING ROOM: The living room is open to the dining area and kitchen, with a beautiful gas-fired rock fireplace and a 46” Samsung flat screen TV, DVD player and cable service. 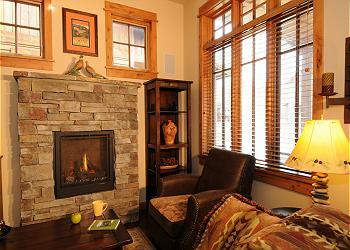 There is a cozy couch and two chairs situated to enjoy the ambiance of the fireplace. You’ll also find a nice collection of board games and books. SETTING, ACREAGE, VIEWS: Bridger Bungalow is located at the edge of Bozeman within the new and very nicely done, Legends at Bridger Creek neighborhood. The developers did a great job linking the property into our community trail system (perfect for walking, biking and even cross country skiing), and making it an attractive neighborhood. Couldn’t have been in a better location for skiing and close to downtown! The heated floors were everything. Recommend this bungalow any day. Bridger Bungalow is located in a quiet little subdivision on the outskirts of town; just a couple minutes drive and we were shopping and dining on main street. A few minutes in the other direction and we were driving through Bridger Canyon. The kitchen area was really nice, modern appliances and lots of counter space with a table and chairs. the house was so comfy, it was a home away from home. We certainly took advantage of the two car garage and also the laundry facilities. Wish we could've stayed longer! Our family of four stayed in the Bridger Bungalow during July 2013. This was our first trip to MT and first experience with Mtn Home. We cannot say enough wonderful things about the home and our stay. Everything was perfect. The home was spotless and the location (Bozeman) was convenient for day trips to Yellowstone and other outdoor activities. The staff at Mtn. Home made sure everything was ready for us and took the time to check on us to ensure that we were happy. We look forward to staying again with Mtn Home in the future. It was a wonderful experience. My family also really enjoyed the Mtn Home app that contained very helpful trip planning ideas and tips. We had a wonderful stay at this condo! It was completely updated, beautifully designed, immaculately clean, and tactfully decorated. It had plenty of space for the 4 of us. It was located in a quiet neighborhood yet a 7-10 minute drive to downtown Bozeman. The only negative was that there was a trundle daybed in the second bedroom along with a TV console which made for a tight squeeze trying to move around in there. Plus, the trundle was not very conducive for adults. However, it was a fabulous condo and we hope to return next year! Highly recommend! There were 5 adults and 1 toddler in our group and the rental was just perfect for all of us. It is located close to everything, Bridger Bowl Ski area, downtown, ice skating rinks and even snowmobiling. The ladies of Mountain Home took great care to make sure we had everything we needed. The condo was very clean and comfortable. We would be happy to stay here again or use Mountain Home's services again to help us find the perfect place to stay while in Montana. My family of 4 stayed in this bungalow for Parent Weekend at MSU. It was stunning with beautiful finishes and amenities throughout the condo. Getting into the condo (late at night) and checking out was super convenient and easy. We loved the setting. Every morning I was able to go for a long run along the creek that runs beside the property. The second bedroom is very small so next time I would look for a bigger unit in the same place!! I highly recommend this rental for 2-3 people. I'd recommend this property to anyone. Very clean and nicely furnished/decorated. Very short ride to downtown in a very peaceful neighborhood. The bungalow met our needs and exceeded our expectations in some areas. The unit is clean and the kitchen is very well equiped. There are three great TV's and basic cable available. The MBR is quite nice and the master bath is terrific. The unit is very dark so most of the lights had to be on to see well. The second bedroom is quite small and has a trundle bed in it. If it were to be expanded it would be difficult to walk around. The unit is a bit off the beaten path and it takes a bit of time to get to the main street restaurants. We enjoyed our stay at Bridger Bungalow! It is well appointed and kept up. The close proximity to the town and the ski hill are pluses for us as well as the excellent care by the rental staff! We recommend it highly! Thank you very much for your great review of Bridger Bungalow and Mountain Home Vacation Rentals! We are glad you enjoyed the home and appreciate your feedback. We hope we will see you another time in the future! Hello Brian! Thank you for your review of Bridger Bungalow. We very much appreciate the recommendation and positive review. We are glad you enjoyed the home and hope to see you in the future! Found the Bridger Bungalow on-line and it seemed to offer all we wanted for annual get together and fishing safari with long time friend. He from Gig Harbor WA and I from Colorado. The arrangements went smoothly and the lodging exceeded our expectations. We furnished, newer property with lots of extras i.e. flat screen TV in both BR and large sitting area. Close to downtown and to fly shop where we met our guide each morning for two days of float fishing the Yellowstone and Madison rivers. Another two days were drove to the Gallatin River and Big Sky for sight seeing and more fishing. 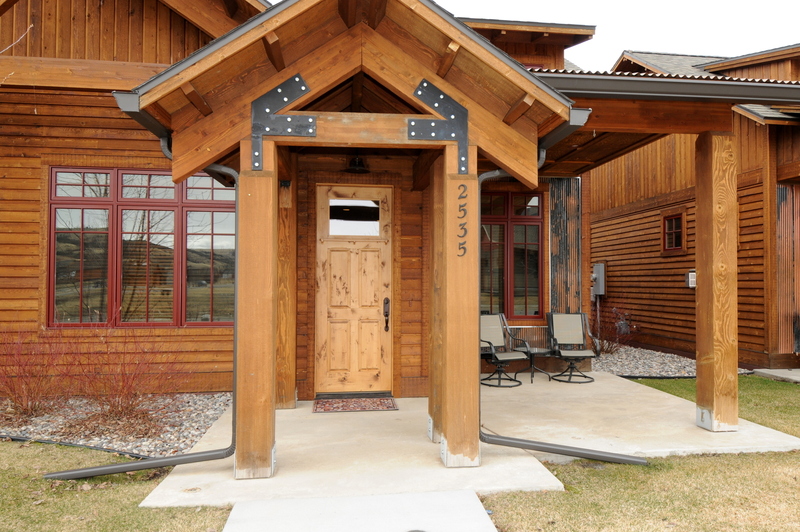 Thank you for your wonderful review of Bridger Bungalow and Mountain Home Vacation Rentals! We are so very glad that the home and experience exceeded your expectations. That is our goal with every reservation! We are also glad to hear that you enjoyed southwest Montana's premier trout waters. Let us know when you are planning another trip as we would love to have you as our guests again! Rental is furnished and decorated in a current contemporary and comfortable style. 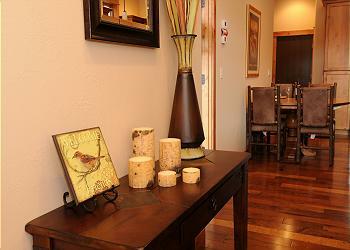 We felt at home and appreciated the comfortable furnishings that are upscale. Hello Kathy! Thank you for your kind words about Bridger Bungalow! We are happy you were comfortable and had everything you needed during your stay. Let us know whenever you are ready to plan another trip to Montana. We would love to help you find the perfect place for your next getaway. Thanks again and have a wonderful day! Was pleasantly surprised when we opened the door to our rental. It was very clean and nicely furnished. There was everything that we needed and more. Mountain home did a great job of having it ready for our arrival. Upon our arrival we found a note that the Internet was not working but someone would be out the next day to repair it. I'll have to say after flying most of the day, we were disappointed that we couldn't get online that evening at the condo , but we just went for dinner and it was fixed the next day when we returned from our day out. We had a plumbing issue that was potentially a problem in the unit so we reported it and they were very responsive. They didn't ask us to use the guest bath, but we did as a courtesy because we didn't want the problem to get worse. 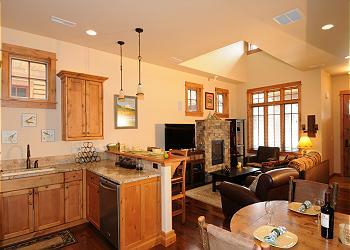 We had a great stay and would definately use mountain home for our vacation rentals from now on. Thank you Debra for your feedback about Bridger Bungalow and Mountain Home Vacation Rentals! We are sorry you had two separate issues during your stay but are glad you appreciated the response time. Whenever problems do arise we try to stay on top of them and get them resolved as soon as possible! Thank you for your understanding and kind words about our business. Let us know whenever you plan to return to the area. We would love to have you as our guests again!